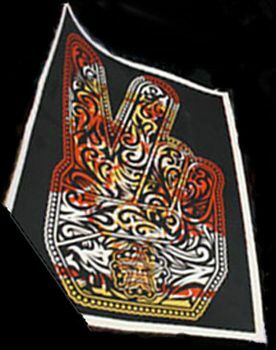 As per Jason Filipow: "Yeah, it's the black 'Peace Fingers' on top of red/yellow "World Odor". It's a 'test' print....scrap/throwaway (from cleaning the screens of ink, etc) from our in-house printer. We don't sell these or make them available in anyway...Shepard occassionally gives them to friends. The photo you have posted is probably from the Obey Clothing offices."